Saying it’s the best thing for local students and their families, officials from New Canaan and Greenwich are asking the organization that oversees high school sports in Connecticut to consider moving a state championship football game this weekend closer to home. The Rams and Cardinals will square off Saturday for a widely anticipated Class LL championship after advancing in the Connecticut Interscholastic Athletic Conference tournament. As it stands, the game is likely to be played at Shelton High School, though NCHS Athletic Director Jay Egan said officials from both lower Fairfield County high schools are asking whether it could be moved to Stamford’s Boyle Stadium, which is available. CIAC officials could not be reached for comment. Asked what reasons CIAC officials have for not playing a New Canaan-Greenwich football game at a venue that’s halfway between them, Egan told NewCanaanite.com that the organization has said championship game sites are set before the season, that they’re chosen carefully with all potential teams in mind and that making a last-minute change could set a bad precedent. 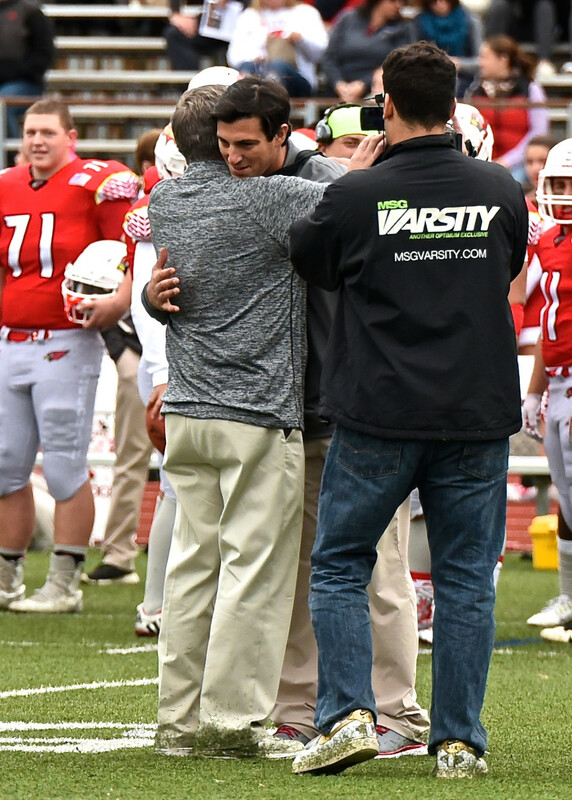 NCHS head coach Lou Marinelli’s Rams have played against a Cardinals team coached by his son, John, four times since the latter took the helm at Greenwich High School in 2015. The elder Marinelli won the first two matchups, the younger the next two. They’ve all been regular season matchups. This year, Greenwich—whose team features sophomore receiver AJ Barber, son of NFL standout Tiki Barber—enters Saturday’s final undefeated on the season. New Canaan has spoiled unbeaten seasons already—for Darien in the Turkey Bowl and Shelton High School on its way to the Class LL final—and the Rams have a seven-game winning streak of their own. The last game they lost was to Greenwich, 42-14, on Oct. 6 at Dunning Stadium. A “Marinelli Bowl” that doubles as a title game “might never happen again,” Egan said. “You cannot be sure with a game like that,” Egan said. For Egan, who said he has “an affinity” for the stately Boyle Stadium at Stamford High School, a perfect venue is waiting. A WPA project launched in 1935, Boyle features ancient Greece-style stone and concrete stands topped with parapets. This is a classic game, two class coaches and two top teams. The first ‘Marinelli Bowl’ is a capstone athletic event. Best of luck to both teams for a clean event and clear victory for the best game of the season. How about the CIAC NOT offering our Veterans a special ticket rate for the Championship Games. The CIAC. DID NOT offer our Veterans a Vets rate for the playoff games. So much for common sense and trying to make it more attractive to students and fans. Not good for teams, families or CT football. Ridiculous decision, CIAC.